I have been arguing, since 2016 (e.g., here, here, and here), that one of the likely outcomes of the kind of corporate tax cuts Donald Trump and his fellow Republicans have supported—and, as we saw, eventually rammed through—would be an increase in inequality. That’s because corporations would likely use a portion of their higher profits to engage in stock buybacks, leading to an increase in stock prices. 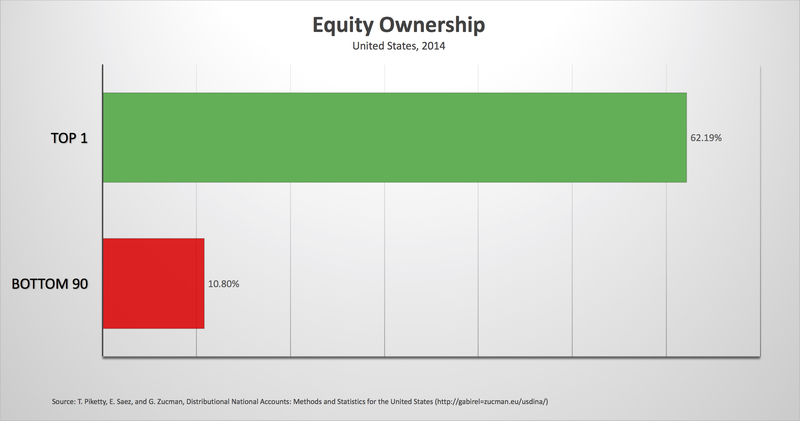 And stock ownership in the United States is already grotesquely unequal. Therefore, the rise in equity prices would disproportionately benefit the small group at the top of the wealth pyramid. And that’s exactly what is happening. 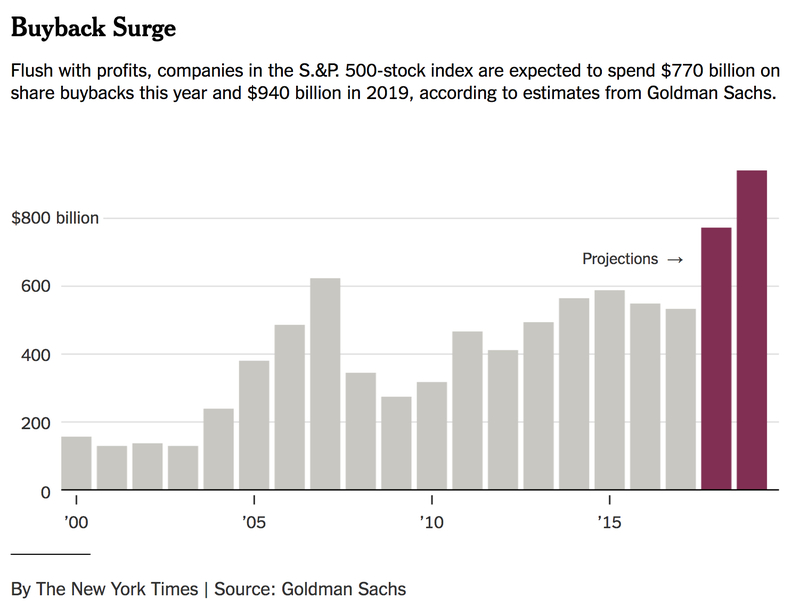 As CNN Money reports, U.S. corporations have showered Wall Street with $214 billion of stock buyback announcements so far this year. 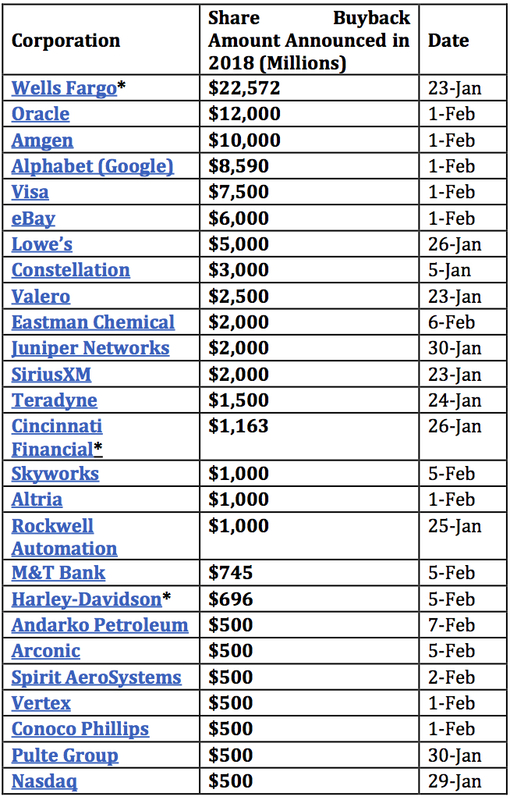 According to a recent report by U.S. Senate Democrats (pdf), that total includes enormous repurchases from a diverse array of large corporations, including Wells Fargo, Oracle, Amgen, and Alphabet (Google). If a major corporation engages in buybacks, that simply transfers money from one set of hands to another — from the corporate entity to the shareholders. That’s exactly right—except, of course, Cowen forgets about the initial transfer of value, the surplus, from workers to corporate boards of directors. 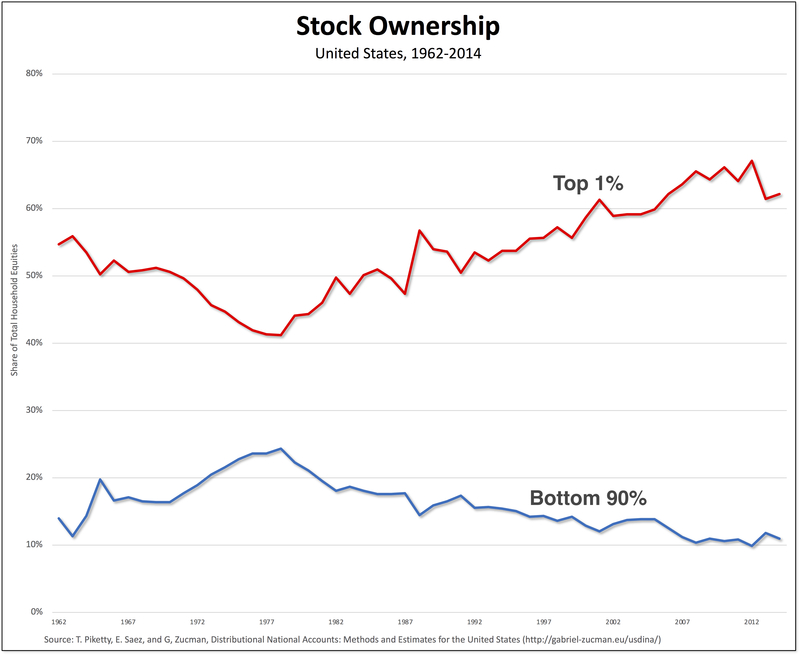 Now consider my estimate of the distribution of stock ownership in the United States, illustrated in the chart at the top of the post. Again, as with the distribution of wealth in the United States, most experts get it wrong (as I showed recently, in a post that was picked up by Market Watch). As of 2014 (the last year for which data are available) the top 1 percent of American taxpayers (the green bar) owned not two or three but almost six times the corporate equities as the bottom 90 percent (the red bar)—62.19 percent compared to only 10.8 percent. So, who are the real beneficiaries of the corporate tax cuts? Not workers (in terms of pay, benefits, or jobs) but the tiny group at the top who already own the bulk of stocks in the United States. * They’re getting wealthier and leaving everyone else further and further behind. Let’s see what kind of economic voodoo the tiny group at the top of the wealth pyramid and their friends in politics and the media are going to use to attempt to buyback that obscene result. *While some corporations have announced one-time bonuses, the money devoted to workers pales in comparison with the buyback bonanza. So far, just 6 percent of the corporate windfall from the tax cuts has gone to workers in the form of pay hikes, bonuses, and other benefits, according to an analysis by JUST Capital.